Held off the scoresheet in two previous head-to-head meetings versus the Storm, Nail Yakupov showed why he’s the top ranked skater for the 2012 NHL Entry Draft on Saturday night against Guelph. With a goal and an assist earlier in the game, Yakupov made the visitors pay for a late defensive lapse as he sped between a pair of Storm defenders and buried the game winner with just three seconds left in regulation to give Sarnia a 5-4 win. 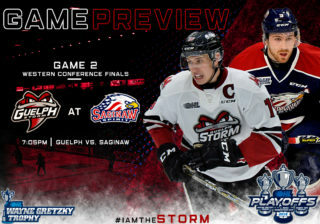 One night after pounding the Owen Sound Attack 6-2 at the Sleeman Centre, the Storm travelled to the RBC Centre in Sarnia looking to jump on the undermanned Sting and make it two in a row. The game plan looked good early as Zack Mitchell and Frank Menard each scored before the first period was eight minutes old. Despite enjoying four first period powerplays compared to one by Guelph, the Sting left the ice after twenty minutes down 2-0. The second period opened with two Storm players in the box and Sarnia capitalized sixty-one seconds in on Reid Boucher’s 25th of the season. The score remained 2-1 until Guelph replied with a powerplay marker of their own. Cody McNaughton continued his hot streak with a wraparound goal at 14:55 to restore the Storm’s two goal cushion. The high powered Sarnia offence turned the game around in a hurry in the final frame. Still 3-1 at the five minute mark, three Sting goals in just 3:37 turned a two-goal lead into a one-goal deficit in the blink of an eye. Then moments after Yakupov’s go ahead strike, Tyler Brown was whistled for hooking and the Storm went to their third powerplay of the night. 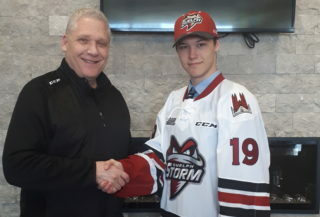 The Storm capitalized on the extra attacker to even the score at four as Jason Dickinson grabbed a Hunter Garlent rebound at the top of the crease and banged in his ninth of the campaign. The two teams exchanged scoring chances before a dramatic finish decided the game. Pressuring the Sting in their own zone from the 19 minute mark on with several great chances, Reid Boucher finally grabbed a rebound on the side wall and when Yakupov sped out of his end, Boucher fired a pass between a pair of Guelph defenders. The Sting star was off to the races and snapped it past Sparks with three seconds to play to crush the visitors. 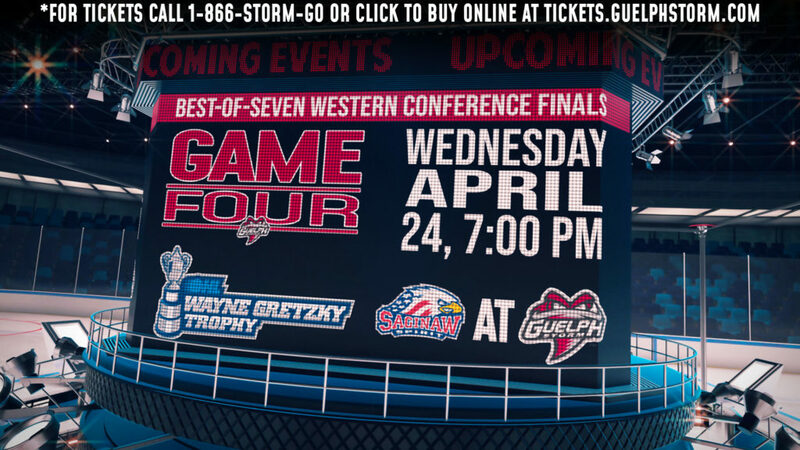 Tomorrow afternoon, Guelph will look to rebound when they host the Kitchener Rangers for the final time this season. Following Sunday’s game, join the Storm for the second and final Town Hall session inside Draught Picks. 1st Period-1, Guelph, Mitchell 30 (Pedan, Dickinson), 1:46. 2, Guelph, Menard 21 (Finn, Garlent), 7:24. Penalties-Gaskin Gue (slashing), 3:34; DeAngelo Sar (high sticking), 8:06; Poliziani Gue (delay of game), 10:58; Pedan Gue (tripping), 19:01; Pereira Gue (slashing), 19:12. 2nd Period-3, Sarnia, Boucher 25 (Yakupov, Spooner), 1:01 (PP). 4, Guelph, McNaughton 23 (Menard, Pedan), 14:55 (PP). Penalties-Brown Sar (delay of game), 14:43. 3rd Period-5, Sarnia, Spooner 27 (Murphy, Rensfeldt), 5:17 (PP). 6, Sarnia, Rensfeldt 18 (Thompson), 8:13. 7, Sarnia, Yakupov 29 (Spooner, Kuzmyk), 8:54. 8, Guelph, Dickinson 9 (Garlent, Kosmachuk), 10:38 (PP). 9, Sarnia, Yakupov 30 (Boucher), 19:57. Penalties-Garlent Gue (hooking), 4:04; Brown Sar (hooking), 9:14. Shots on Goal-Guelph 6-15-12-33. Sarnia 8-12-15-35. 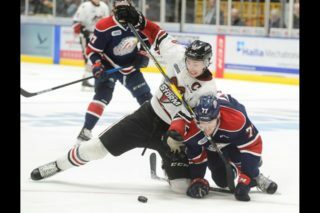 Power Play Opportunities-Guelph 2 / 3; Sarnia 2 / 5. Goalies-Guelph, Sparks 21-22-1-2 (35 shots-30 saves). Sarnia, Anderson 24-18-2-4 (33 shots-29 saves). Referees-Bob Langdon (7), David Gauthier (28). Linesmen-Drew Jackson (57), Dustin McCrank (68).